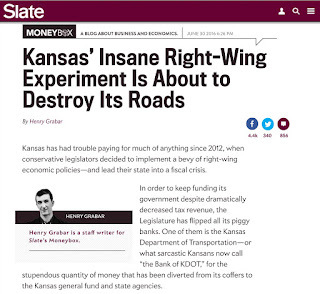 Expect financial turmoil in Kansas to continue. 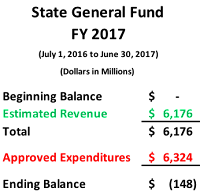 Lawmakers left Topeka after approving revisions to the budgets already in place for FY 2016 and FY 2017, but failed to solve the underlying problem facing the state. As a result of unaffordable tax cuts, Kansas does not receive enough revenue to pay bills. 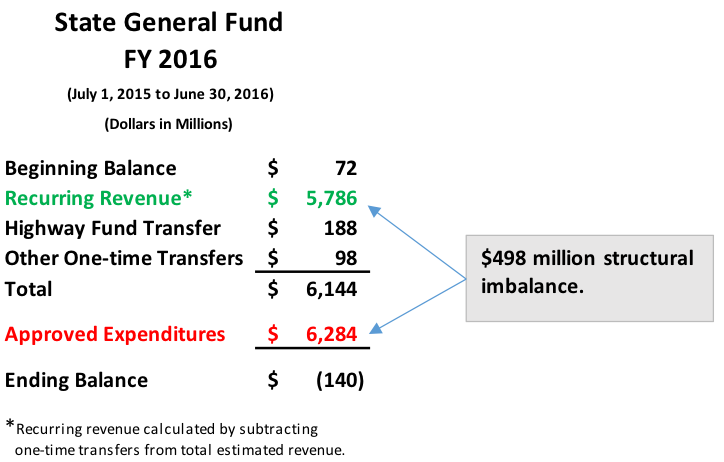 The FY 2016 budget that lawmakers passed has a large structural imbalance, and would leave the general fund $140 million below zero at the end of the fiscal year. To avoid the negative ending balance, lawmakers are expecting the governor to use his powers to transfer yet another $70 million from the highway fund. That would technically increase general fund revenue, but it’s more one-time money that does not narrow the structural imbalance. Lawmakers also expect the governor to “delay” a $96 million payment to the retirement system until FY 2018, which would lower total expenditures in FY 2016 but increase expenditures in FY 2018. 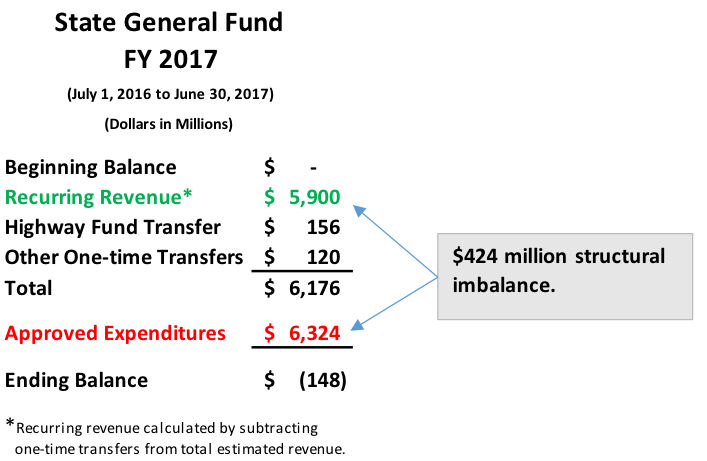 The FY 2017 budget also has a large structural imbalance, and a negative ending balance. Lawmakers are expecting the governor to order an additional transfer of $115 million from the highway fund, and to also cut expenditures (details of the cuts unknown) enough to avoid the negative ending balance. Now consider FY 2018. When lawmakers convene a new legislative session in January, they must create a brand-new budget for FY 2018. How will that work? 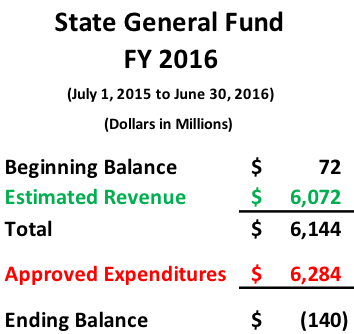 Recurring revenue in FY 2017 totals $5.9 billion. With luck, that might grow a little in FY 2018, but under current policy, hoping for much more than $6.0 billion would be quite optimistic. 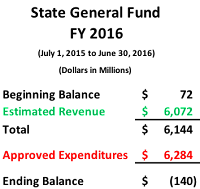 Legislators set expenses for FY 2017 at $6.324 billion, but in FY 2018 expenses will be higher. The 4th quarter KPERS payment from FY 2016 must be paid. Add $96 million plus 8 percent interest for that. Medicaid costs will go up $60 or $70 million, maybe more. Of course other costs will rise as well, but just the Medicaid and KPERS increases alone will push expenses to $6.5 billion, far above recurring revenue. And the bank account will be empty and the highway fund tapped out. Will lawmakers be able to address problems in the budget like staffing shortages at state hospitals and prisons? Not without making the overall financial situation worse. What if happens if the Kansas Supreme Court declares school funding constitutionally inadequate? The state will have little recourse. What happens if the economy actually goes into recession? Everything gets worse. The Kansas budget has been structurally unbalanced every year since the 2012/2013 tax cuts went into effect, putting the state in a highly precarious financial situation. Budget actions in this legislative session did not address or correct that. The state’s grim financial prognosis will persist until the underlying problem gets fixed.